Maine is a state in the New England region of the northeastern United States, and is bordered by the Atlantic Ocean to the east and south. The 23rd state is famous for its scenery—3,500 miles of rocky, tidal coastline, low, rolling mountains, heavily forested interior and picturesque waterways—as well as for its seafood, especially lobster and clams. Also in the north-easternmost area is the Old Sow, the largest tidal whirlpool in the Western Hemisphere. 25 miles off East Africa, the coral park reserve surrounding Chumbe Island Coral Park houses some 400 species of fish native to the Zanzibar Island chain. Up until recently the island was uninhabited, but since becoming a wildlife refuge in the 1990’s, it now holds 7 seaside “eco-bungalows”, providing perfect accommodations for the more elusive traveler. 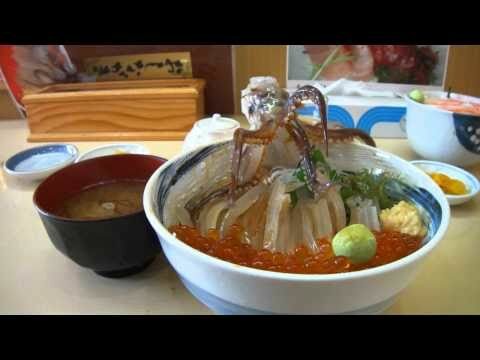 Odori Don is a hakodate dish where a squid’s head is removed and its legs are served nearly fresh. So fresh that adding soy sauce to the squid causes its legs to dance, even with its brain detached. That’s right–this squid dances without its brain*. When American soldiers returned home from World War II, they brought with them stories and souvenirs from the South Pacific. James Michener won the 1948 Pulitzer Prize for his collection of short stories, Tales of the South Pacific, which in turn was the basis for South Pacific, the 1949 musical by Rodgers and Hammerstein, also a Pulitzer Prize winner. In addition to the returning WWII veterans, several other factors contributed to the mid-century American explosion in Polynesian Kitsch Pop culture or Tiki Culture. Post-war America saw the rise of the middle class as an economic force. This coupled with ever increasing affordability of travel, particularly newly established air travel to Hawaii, helped to propel the nation’s interest in all things tropical. Hawaiian statehood was a major factor which further increased popularity of the tropical lifestyle, and Americans fell in love with their romanticized version of an exotic culture. contributing was the excitement surrounding the Kon-Tiki expedition. Utoeya is an island 1,600 feet offshore and about 24 miles northwest of Oslo, Norway in the Tyrifjorden fjord, county of Buskerud. It’s name roughly translates to “outermost island”. It was gifted to the AUF (the Labour Party Youth) by the trade unions in Oslo after WWII, and was the site of 32-year-old Anders Behring Breivik’s horrible massacre on Friday, an atrocity which Norway’s Prime Minister is calling the nation’s worst act of violence since WWII. “It is such a fantastic place! A tiny, picturesque island…” said Frode Berge, AUF leader of the Rogaland region of Norway, who was present on the island during the attack. Tired of the discomfort brought about by that crappy plastic many swim goggles are made with? Well, these goggles made from 100% fish scales might not help with that problem too much; but they’re surely a stylistic improvement. (CNN) — On a small uninhabited island that’s but a small dot on the Pacific, 15 marooned people joined hands to form a giant “SOS” on the beach. Washed up in a deserted paradise, all the castaways could do was to hope that someone would spot them. After searching over 18,000 miles in a matter of 76 hours, the coast guard finally spotted the castaways and has sent personnel to check up on them.